PHILADELPHIA — Treatment with the drug decitabine prior to administration of chemotherapy and a cancer vaccine yielded clinical benefit for women with recurrent ovarian cancer, suggesting that this combinatorial chemoimmunotherapy may provide a new treatment option for patients with this disease, according to a study published in Cancer Immunology Research, a journal of the American Association for Cancer Research. A prerequisite for a patient’s immune system to recognize and attack his or her tumor is the presence of high levels of a protein not normally found in the patient’s healthy cells. Proteins with this profile are called tumor antigens and can be good targets for anticancer vaccines. 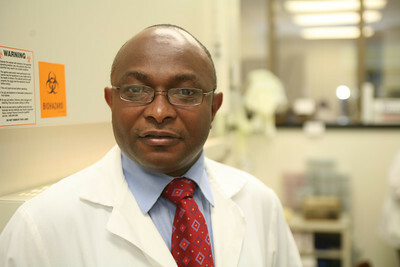 “NY-ESO-1 is one of the few tumor antigens that have restricted expression in normal tissues but become aberrantly expressed in epithelial ovarian cancers and other solid tumors, so we focused on this antigen as the lead candidate for development of cancer immunotherapy,” said Kunle Odunsi, M.D., Ph.D., principal investigator of the study, the M. Steven Piver professor and chair of the Department of Gynecologic Oncology, and director of the Center for Immunotherapy at Roswell Park Comprehensive Cancer Center (Roswell Park) in Buffalo, N.Y. “However, we observed that this antigen is not uniformly expressed by epithelial ovarian cancers, so our goal was to force the expression of NY-ESO-1 on ovarian cancer cells in order to allow the immune system to recognize and attack them. Odunsi and colleagues conducted a phase I dose-escalation trial of decitabine, to which they recruited 12 women with epithelial ovarian cancer that had not responded to multiple lines of chemotherapy, with an estimated progression-free survival time of three months. All patients received decitabine on day one, the chemotherapy drug doxorubicin on day eight, and the cancer vaccine (NY-ESO-1 protein with Montanide and GM-CSF) on day 15. In preclinical analysis reported as part of this study, the investigators established the best sequence of drug administration: decitabine was effective only when administered before chemotherapy, and it was ineffective if given after chemotherapy; vaccine administration was the last step. The clinical trial participants were randomly assigned to receive a low, middle, or high dose of decitabine. Of the 10 patients evaluable for clinical response, five had stable disease for up to 7.8 months, and one had a partial response with disease remission that lasted 5.8 months. All patients from the low- and middle-dose cohorts of decitabine showed clinical benefit, whereas one-third of the patients who received the high dose showed benefit. These data suggest that lower doses of decitabine are associated with improved clinical response using this regimen. The treatment was well tolerated, and adverse events included hematologic side effects that were clinically manageable, according to Odunsi. “One of the most remarkable results in terms of immune responses was that we were able to evoke what we call ‘antigen spreading,’” he said. “Although we immunized against a single target [NY-ES0-1], we analyzed and found that we were able to induce immune responses against three other antigens, against which we did not immunize. “We propose that patients should actively seek these kinds of combination therapies. Even though the majority of these types of therapies are experimental at this point, there is enough scientific and clinical evidence to indicate that they are likely to be beneficial,” Odunsi added. To this end, Odunsi and Adam R. Karpf, Ph.D., a co-principal investigator of the study and associate professor at the Eppley Institute and member of the Fred and Pamela Buffett Cancer Center in the University of Nebraska Medical Center in Omaha, are currently planning a phase II trial at Roswell Park Comprehensive Cancer Center and the Fred and Pamela Buffett Cancer Center to test whether this treatment approach lengthens progression-free survival in patients with ovarian cancer. This study was funded by the Ovarian Cancer Research Fund, the Roswell Park Alliance Foundation, a Cancer Vaccine Collaborative Grant, the Anna Maria Kellen Clinical Investigator Award, the National Cancer Institute, and Eisai Pharmaceuticals. Odunsi has declared no conflicts of interest. Founded in 1907, the American Association for Cancer Research (AACR) is the world’s oldest and largest professional organization dedicated to advancing cancer research and its mission to prevent and cure cancer. AACR membership includes more than 34,000 laboratory, translational, and clinical researchers; population scientists; other health care professionals; and cancer advocates residing in more than 90 countries. The AACR marshals the full spectrum of expertise of the cancer community to accelerate progress in the prevention, biology, diagnosis, and treatment of cancer by annually convening more than 20 conferences and educational workshops, the largest of which is the AACR Annual Meeting with more than 18,000 attendees. In addition, the AACR publishes eight peer-reviewed scientific journals and a magazine for cancer survivors, patients, and their caregivers. The AACR funds meritorious research directly as well as in cooperation with numerous cancer organizations. As the scientific partner of Stand Up To Cancer, the AACR provides expert peer review, grants administration, and scientific oversight of team science and individual grants in cancer research that have the potential for near-term patient benefit. The AACR actively communicates with legislators and policymakers about the value of cancer research and related biomedical science in saving lives from cancer. For more information about the AACR, visit www.AACR.org.